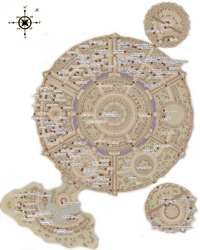 Underneath the Imperial City is a sewer system as large as the city itself. The sewers can be accessed from most districts of the city; there are also a few entrances outside of the city. The sewer system is a fairly complex maze. The east and west sections of the sewer do not connect to each other, but within those sections there are many interconnections. Occasionally, when a person from the Imperial City tries to go a different district than they are already in, their AI will decide that going through the sewers is quicker than walking the streets; so they'll duck into the nearest house with a sewer entrance in the basement and travel underground, possibly putting themselves in danger from rats and Goblins. The North Tunnel (accessed from the Imperial Sewers N. Exit). The Market Sewers (under the Market District). Beneath the Bloodworks (under the Arena District, but not accessible from there). The South East Tunnel (under the Arboretum, and also accessible from the Imperial Sewers SE. Exit). The Elven Garden Sewers (under the Elven Gardens District). This sewer system also contains Sunken Sewers and Sewer Waterworks. The Talos Plaza Sewers (under the Talos Plaza District). The Temple Sewers (under the Temple District, but not accessible from there). This sewer system also contains The South West Tunnel. Imperial Prison Sewer, which should be familiar to all players as part of the tutorial. A different version of it is also used during Scheduled for Execution. The watch towers are the tall structures located in six "corners" of the city. They serve as a bunker for the Imperial Guards, many of which can be found sleeping at night on the towers' upper floors. This, of course, includes many essential and temporarily-essential guards. Such guards include Hieronymus Lex and Adamus Phillida, who become non-essential at the end of the Thieves Guild quest Taking Care of Lex and upon acceptance of the Dark Brotherhood quest Permanent Retirement, respectively. 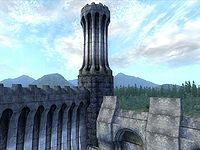 There is a watch tower at each of six "corners" of the Imperial City. Their names make their locations rather self-explanatory. Buy a house in the Imperial City: Get your foot on the property ladder with a rundown shack in a poor district. An Unexpected Voyage: The Bloated Float Inn has been hijacked by brigands while you slept! The Arena - Join the Arena faction; fight for honor and Gold! Liberation or Apprehension: Locate a Necromancer informant and return him safely to the Arcane University. The Necromancer's Amulet: Find the Necromancer's Amulet and return it to the Arcane University. The Bloodworm Helm: Find the Bloodworm Helm and return it to the Arcane University. Ambush: Oversee a contingent of Battlemages in their fight against the Necromancers and retrieve a unique Black Soul Gem from an old "friend". Untaxing the Poor: Steal the tax records for the Waterfront residents. The Ultimate Heist: Steal an Elder Scroll for the Gray Fox, and for glory! 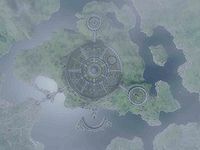 The Imperial City also appears in Arena, Oblivion Mobile, and ESO. It's possible to climb over the walls and out of the city. See this for details. This page was last modified on 19 November 2018, at 03:38.